A new Mummy movie is looming from Universal with promises (threats?) that it's the first of a new shared universe (a "Dark Universe," if you will) that will revive all their classic monsters for modern popcorn munchers. Because the marketing machine is in full swing, all the previous Mummy movies have just been re-released, with some of them restored in HD for the first time.What better excuse to binge on classic horror? 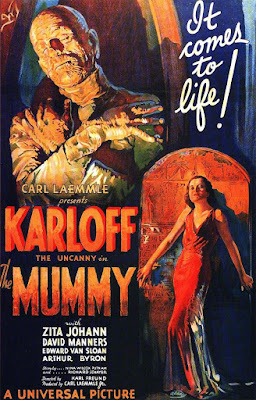 In this inaugural installment, we're looking at the film that started it all: 1932's The Mummy. 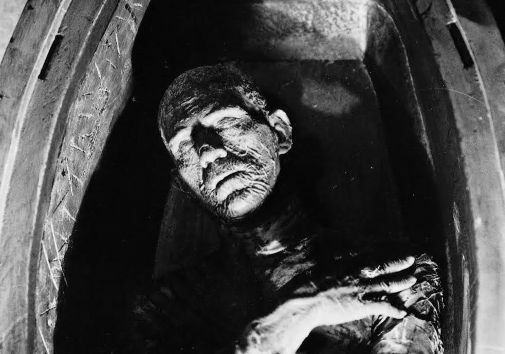 The Mummy is part of the initial wave of horror films that basically created the genre. Well, that's a bit of an overstatement; there had been horror before, including awesome silent movies like Nosferatu, The Cabinet of Dr. Caligari, and the stunning-for-its-time 1920 version of Dr. Jekyll and Mr. Hyde. It would probably be more accurate to say that these early thirties horror movies brought a new level of creepiness and production value for the talkie era, and Frankenstein, Dracula, and The Mummy set the standard for...well, for what we would expect from our monsters from that point forward. We wouldn't see anything else as iconic as these guys until Michael Myers, Freddy Krueger, and Jason Voorhees, some fifty years later. The Mummy is a bit different from other monster movies, though, because there's not a ton of horror. It's more of a romance that spans the ages. The movie tells us that there was a man in ancient Egypt named Imhotep (Boris Karloff) who had a secret love affair with a foxy lady (Ankh-es-en-amon, played by Zita Johann) and tried to use occult power to go against the will of the gods in an effort to bring her back to life. He was busted in the act, and sentenced to being mummified alive. Cut to a few years later (well, a few millenia) when archaeologists dig into his tomb and read a cursed scroll which restores him to life. The Mummy is loose, and he's still driven by his love for Ankh-es-en-amon, who just happens to look exactly like a modern woman named Helen, who actually seems to be the reincarnation of his lover. The Mummy, like most Universal Horror, involves the monster pursuing a person or a thing which it believes will give it peace. Boris Karloff has defined what we think of when we think of mummies. The incredible make-up job done by legend Jack Pierce (the guy who turned Karloff into Frankenstein's Monster) still looks great 85 years after the fact. Actually, we get two make-up jobs: the first, decayed mummy, and the more fleshy, wrinkled effect that Imhotep affects when he's in disguise as Ardath Bey. Both look amazing. What's kind of easy to forget is that there isn't really much in the way of horror with the mummy sneaking around and killing people in the dark. That would mostly come in later movies. What we get in this film is really just Karloff trying to get to Johann, putting her under a spell, and then British Museum officials saying things like "Oh, my dear girl, you're acting positively strange! You need rest. Yes, rest!" This goes on until we reach the climax of the film,which features Zita Johann in a skimpy little costume that she NEVER would have been able to wear when the decency police tightened their grips (and their sphincters) shortly after this movie was released. Truthfully, there's not a ton to The Mummy, and yet it's still totally awesome. It's an A-level production all the way, with outstanding cinematography, good direction, beautiful sets, and an Egyptian aesthetic that will always be cool. There isn't really any comedy or levity, just Karloff's sad intensity and Johann's confused attraction. Both work incredibly well, even though they're rooted in a style of movie that hasn't been made in a long, long time. Look, it's easy to criticize movies like this in our modern age because they don't have lengthy action scenes or brutal, on-screen violence. Hollywood movies, especially at this stage, were more akin to stage plays than the cinema that we think of now. It requires a little bit of effort on our part to immerse ourselves into these worlds nearly nine decades later, but I think it's worth it. These movies really breathe: there are rarely quick cuts, but if you think of it as a fine aged wine, which also needs to breathe, you may find yourself caught up in this style of film. Watch enough of them and you may start to appreciate them more than what's playing at your local theater. All these Universal Monster movies have the same thing in common: atmosphere. These are the movies that built Halloween as every single one of us knows it. Jagged towers, crooked tombstones, dusty passages, and long shadows are the hallmarks of Universal Horror, and watching these movies, even for the first time, somehow feels like coming home. I really do love this movie, and I try to revisit it at least once a year. 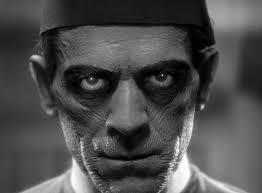 Having said that, The Mummy himself is not in the same league as Dracula, Frankenstein, or the Wolf Man. I put Imhotep in the second tier of Universal Monsters, along with The Invisible Man and Gill Man from The Creature from the Black Lagoon. Without this movie, there would be no Mummy in our pop culture.Furthermore, the original The Mummy is a classy little shindig. The horror of an undead zombie-like creature lurking in the darkness while dragging a linen-wrapped leg behind it would come in later movies, not here. This movie is a big Hollywood production, more romance than chills, but creepy and atmospheric enough to be iconic. This one's a deserved classic.